The Province of Nova Scotia has set an ambitious renewable energy production target of 40% by 2020. One of the mechanisms to achieve this goal, initiated by the Province, was the creation of the Fundy Ocean Research Centre for Energy (FORCE) tidal turbine test facility in the Minas Passage, Bay of Fundy (http://fundyforce.ca). The first of two commercial-scale tidal turbines (16 m diameter Open Hydro turbines) connected to the electrical grid were deployed in November 2016. The effects of large commercial scale tidal energy development on fish are not yet well understood, but are of key concern to industry regulators, the scientific community, fishers, and other stakeholders. To help address the environmental monitoring challenges and gaps in knowledge faced by tidal energy developers, FORCE developed three Fundy Advanced Sensor Technology (FAST) subsea instrumentation platforms. These platforms are equipped with arrays of environmental sensors to monitor both the physical and biological characteristics of the FORCE test area, and are deployed autonomously or cabled to shore for real-time data viewing and collection. These platforms are used for different purposes. The largest platform, known as FAST-1, has been predominantly used for hydrodynamic data collection. FAST-2 is currently being outfitted to view animals interacting with tidal energy devices (e.g. using optical or hydroacoustic sensors), and FAST-3 will be used to collect general information on fish use of the FORCE test site. FAST-3 was deployed for the first time in February 2017 at a test location near the FORCE site. The sensors on the FAST-3 platform include an Acoustic Doppler Current Profiler (ADCP) and two echosounders: the ASL Acoustic Zooplankton and Fish Profiler (AZFP) and the Simrad Wideband Autonomous Transceiver (WBAT). The echosounders face upward to track the density and vertical distribution of fish over time, and the ADCP provides simultaneous information on current speed and direction. This platform will be deployed at the FORCE test site, for periods of one month, several times per year. Haley Viehman, a post-doctoral researcher at the Acadia Centre for Estuarine Research at Acadia University, will be analyzing these data to improve our understanding of fish abundance patterns at the test site and their likelihood of encountering tidal energy devices based on their vertical distribution in the water column. Fast-3 sensor platform gets ready for deployment near the FORCE test site. 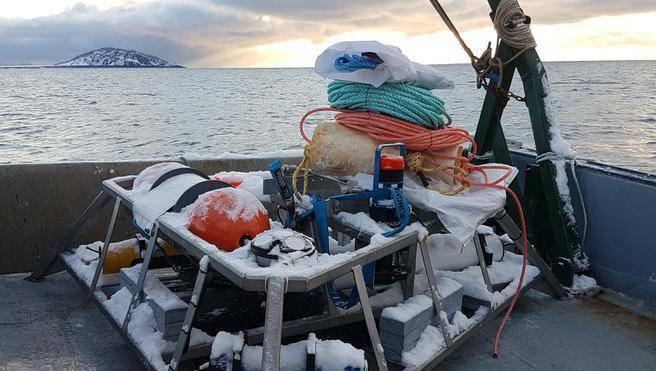 Collecting data with two echosounders at once will allow researchers to compare performance and explore what questions can be answered by each system. The AZFP echosounder is a single-beam, narrowband (single frequency) system that can provide relative indices of fish density over time. The WBAT echosounder is a split-beam, broadband (many frequencies) system, and it can provide more accurate information on individual acoustic targets. The wide range of frequencies used by the WBAT may also prove useful in identifying different species of fish, though this remains to be tested. By determining what types of information can be reliably provided by different technologies, we can begin to determine which tools are best suited to answer specific questions. This information will aid in developing best practices and standards for environmental monitoring at FORCE and other tidal energy sites around the world. Information from the FAST-3 platform will be augmented by data collected as part of FORCE’s Environmental Effects Monitoring Plan, which includes echosounder surveys conducted from a moving vessel. These surveys cover the entire FORCE test site as well as a control location across the Passage, for 24 hour periods several times per year. Surveys were carried out by Gary Melvin and Norman Cochrane of DFO in 2011 (August, September, and November) and 2012 (January, March, and May), and continued by FORCE in collaboration with the University of Maine in 2016 (May, August, October, and November) and 2017 (January and March), with future surveys planned through 2017 and 2018. The wider-ranging spatial coverage of these surveys will be combined with the longer temporal coverage provided by the FAST-3 platform for a better understanding of fish abundance and distribution at and near the FORCE test site, and for better predictions of potential tidal energy device effects.